A camp counselor died Wednesday, July 3, 2013, when a tree spontaneously fell on her at a popular Jewish summer camp near Yosemite National Park. A counselor from Santa Cruz died Wednesday when a tree spontaneously fell on her at a popular Jewish summer camp near Yosemite National Park. In a letter sent to parents, the camp director identified Annais Rittenberg as the young woman who had been killed. He called her a "beloved member of the Camp Tawonga staff." Four other female camp counselors, who NBC Bay Area is not naming, were injured. Two of the women, ages 20 and 21 were taken to Sonora Regional Medical Center with minor injuries, hospital spokeswoman Gail Witzelsteiner said. Witzlsteiner says two other patients were transported to hospitals in Modesto. Camp Executive Director Ken Kramarz, in his letter, emphasized that no children were injured. He added that all the families of the injured victims have been contacted. The large tree fell onto the campfire circle outside of the dining hall just before 8:30 a.m., according to the Tuolomne County Sheriff. The Tuolumne County Sheriff's Office says it has no plans to further investigate what caused a chunk of the black oak tree to fall and kill Rittenberg. The tree had been inspected recently, but it showed no obvious signs of rotting or disease, and weather did not appear to be a factor. Rittenberg attended the University of California at Santa Cruz where she was poised to be a senior this year, according to the campus spokesperson. On her Facebook page, Rittenberg listed that she was studying environmental science, working at KZSC radio and was originally from New York. Kramarz said the campers were having breakfast in the dining hall, and as soon as the accident happened, camp leaders took the children away from the scene to play. He said the campers were doing well and that grief counselors were on hand. Despite that, parents of campers back in the Bay Area were extremely concerned. "I'm kind of shaken up and scared," said Caroline Hastings of Oakland, whose daughter attends the camp. 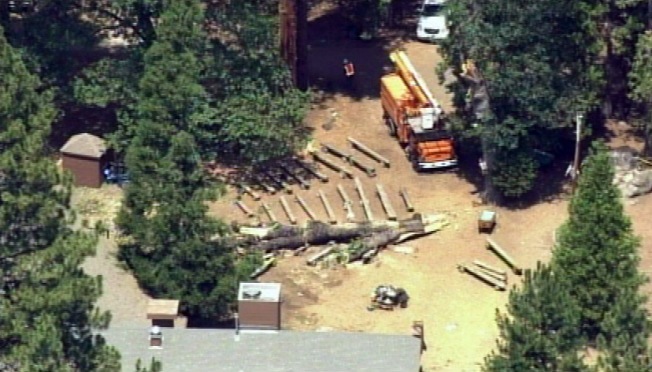 In addition, part of the falling tree struck a PG&E power line, temporarily interrupting some of the camp's electrical service. There are about 250 campers — many who come from the Bay Area — and 150 staff at the facility on Mather Road in Groveland. Tawonga runs programs and camps throughout the year, including for Jewish adults, singles and gay and lesbian families. In the summer, Camp Tawonga holds several sessions for students in 2nd grade through 10th grade. Currently, campers are in their second session, which ends on Friday. The camp is located in a remote area of Tuolumne County on 160 acres outside of Yosemite National Park. Its neighbor is San Jose Family Camp. Campers have been flocking to Tawonga since 1925. The camp is known for its Jewish-themed outdoor fun, social action and community-minded spirit.